UPDATED: Gloves , toboggans and blankets warmed audiences in Downtown gathered for the Christmas Parade, which welcomed Santa Claus and had a guest appearance by Elsa. Mayor Steve Williams walked the parade route expressing holiday cheer to viewers. We have added some photos with credit to Huntington Mayor's Office. Some current and incoming members of Huntington City Council rode the trolley styled bus provided by The Transit Authority. 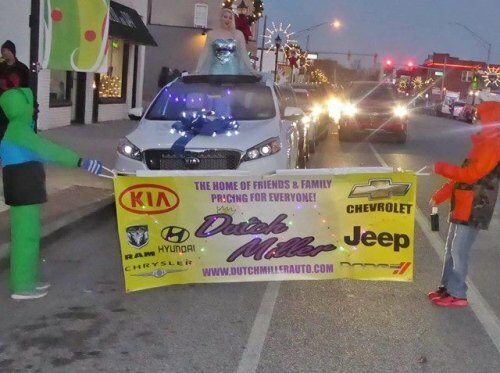 Dutch Miller sponsored the parade and provided the vehicle for Elsa. Elsa appears as a 'substitute Santa' on Saturday, Dec. 17 from 12 noon to 4 p.m.at Timewarp Cards and Comics at the Eastgate Mall in Cincinnati, Ohio.